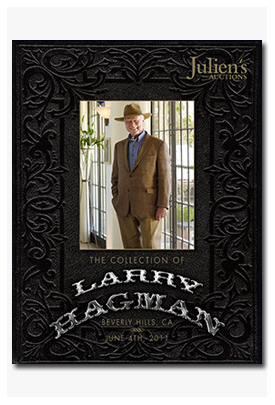 The limited edition fully-illustrated color catalog for the Collection of Larry Hagman contains over 400 items from his life and career. During his remarkable career Larry and his wife Maj have collected fine antiques and collectibles and memorabilia from a career that spans over 50 years. This beautiful catalog offers a unique insight into their private life with an abundance of elegant furnishings from their hilltop estate Heaven, a spectacular property built by the Hagmans in 1991 overlooking the Ojai Valley. This auction catalog also showcases items from the estate of Mary Martin, Larry’s mother and acclaimed stage actress in her own right. The Collection of Larry Hagman auction catalog offers fans and collectors a rare opportunity to see this collection one last time and to own a piece of Hollywood history and personal items, each with its own story to tell. Each new, still in original shrinkwrap, Julien's Auctions catalog sells for $50.00. Order your new Julien's Auction catalog using the below the PayPal button.